Tahiti Trader Bio-Noni for Women is an advanced anti-aging supplement for the relief of PMS, Peri Menopause and Menopause symptoms. Bio-Noni's natural therapeutic properties work to reliver tension, balance hormones, build collagen and bone density, protect and promote cardiovascular health. 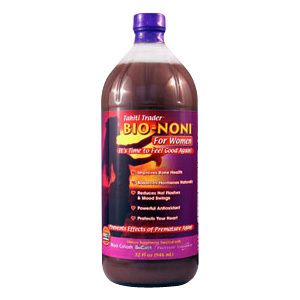 Bio-Noni contains nutrients that are scientifically proven to build bone strength and to deliver relief from hot flashes, night sweats, irritability and related sleeplessness associated with PMS and menopause. other ingredients: Noni Extract (From Puree), Concord Grape Juice, Natural Raspberry Flavor, Natural Flavors, White Grape Juice.